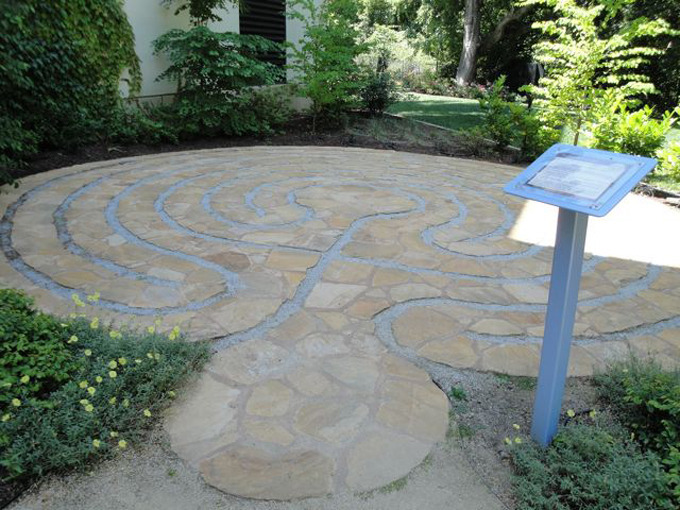 To prepare for your journey in the labyrinth space, you enter the small space immediately at the entrance to the main labyrinth which is called the Heart Space. This area gets you ready for the zen experience of walking the path. 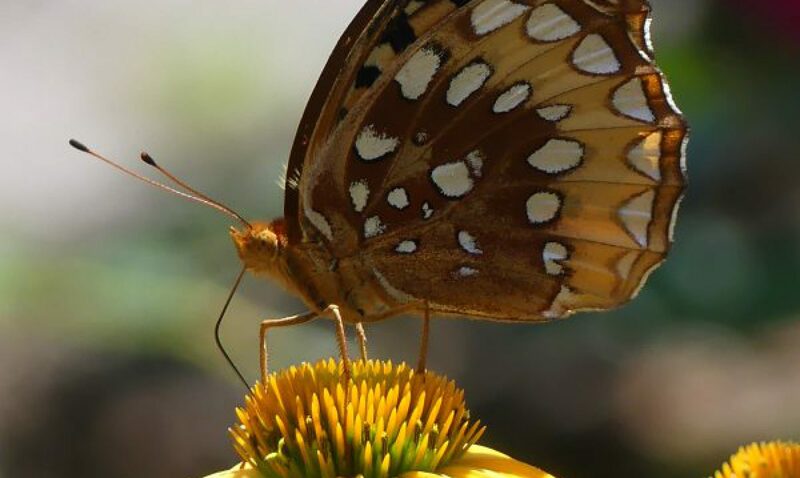 If you have someone in mind when you walk, then bring something – a memento, picture, flowers, feathers, or whatever gets you in the mood and reminds you of them. With that in mind in designing the area, I thought a water feature right next to the heart space where you could dip your fingers into the water before your journey would work well. Once the Heart Space was marked out, I marked out the water feature to the right of the Heart Space. 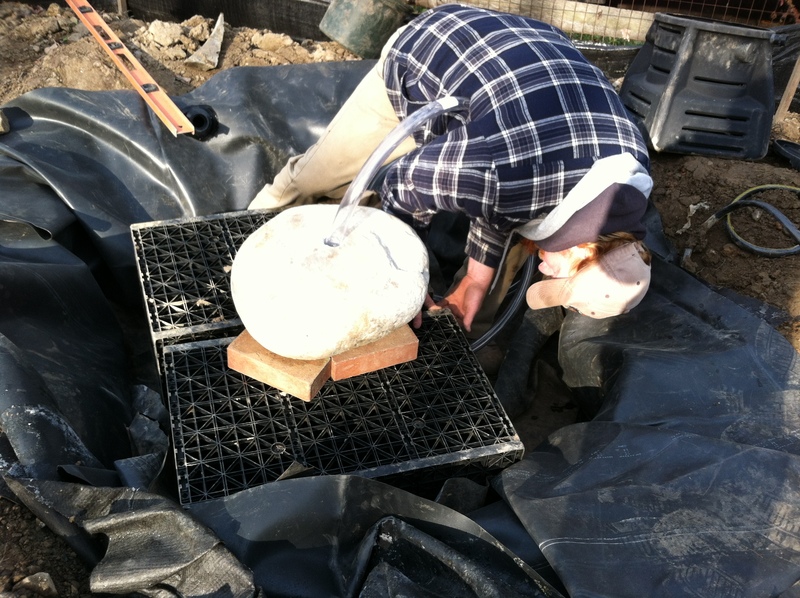 Before the paving for the Heart Space could be laid, we had to excavate for the reservoir for the boulder fountain. A large hole around 4 feet wide and 2 feet deep had to be dug and lined with butyl rubber to hold the water that would be re-circulating through the fountain. 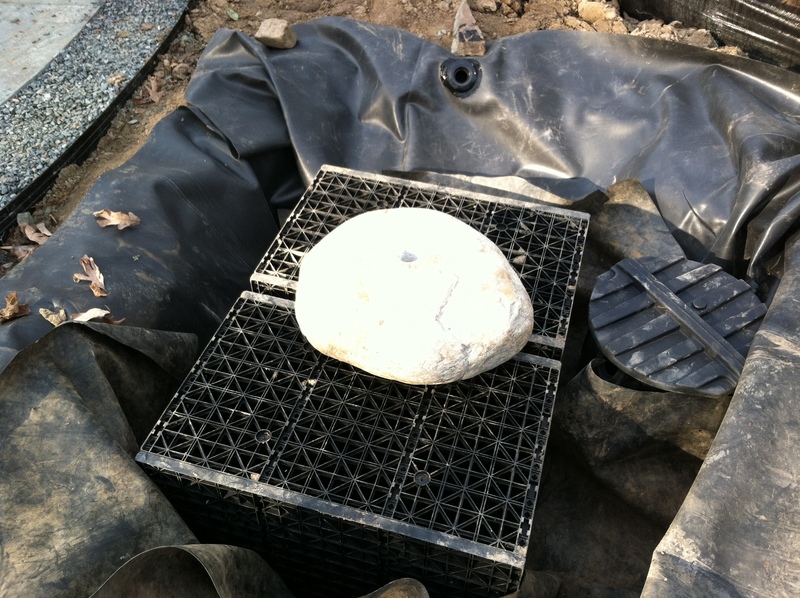 Large matrix boxes that looked like plastic crates were installed in the reservoir to create a sturdy platform for the boulder. 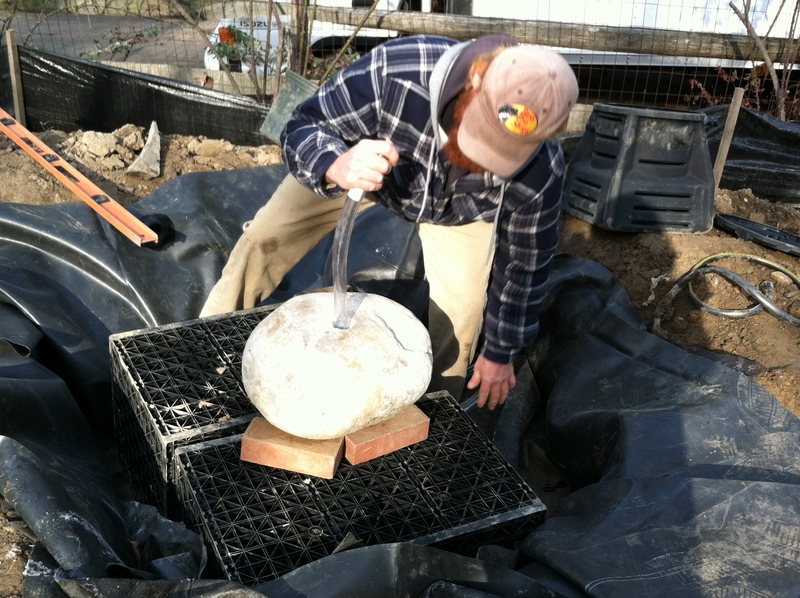 I had hand selected the boulder previously and picked a smooth oval one just the right size for the space. 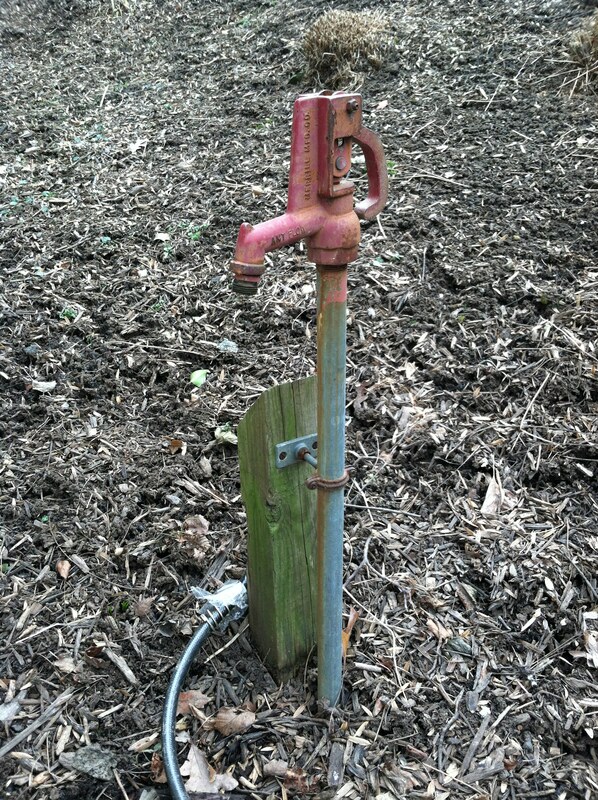 It was then drilled through the center for the water to re-circulate. The pump vault simply houses the pump so that you can easily get to it for service. Everything had to be placed perfectly level and 2 inches above the grade of the labyrinth so that water coming down off the hillside wouldn’t inundate the water feature with wash out during a storm. An auto-fill line was installed from a nearby hydrant so that the fountain would never run out of water. Typically evaporation and splashing will reduce the water volume over time, and this way you wouldn’t have to check on the fountain constantly and refill it by hand. Also, an overflow was buried from the reservoir to the lane to take care of any excessive run off. 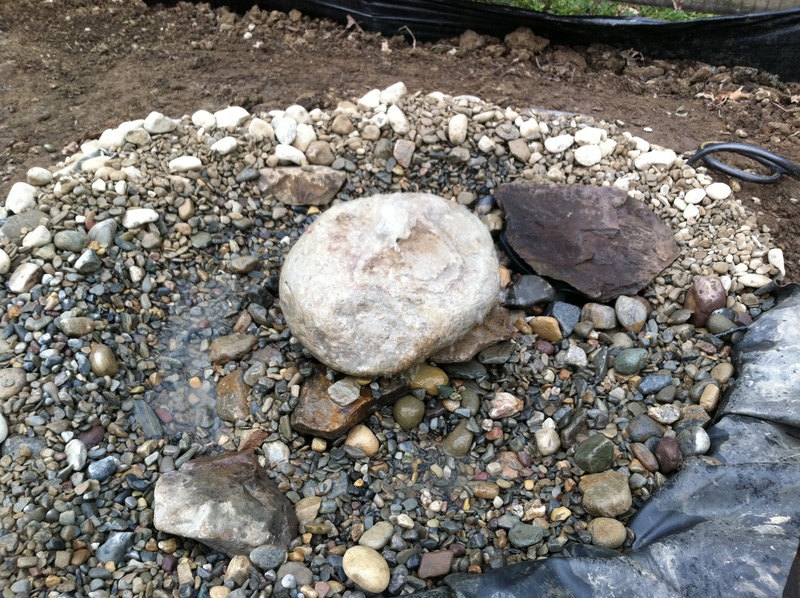 Then we filled in with River Jack and larger pieces of Pennsylvania Fieldstone chunks. 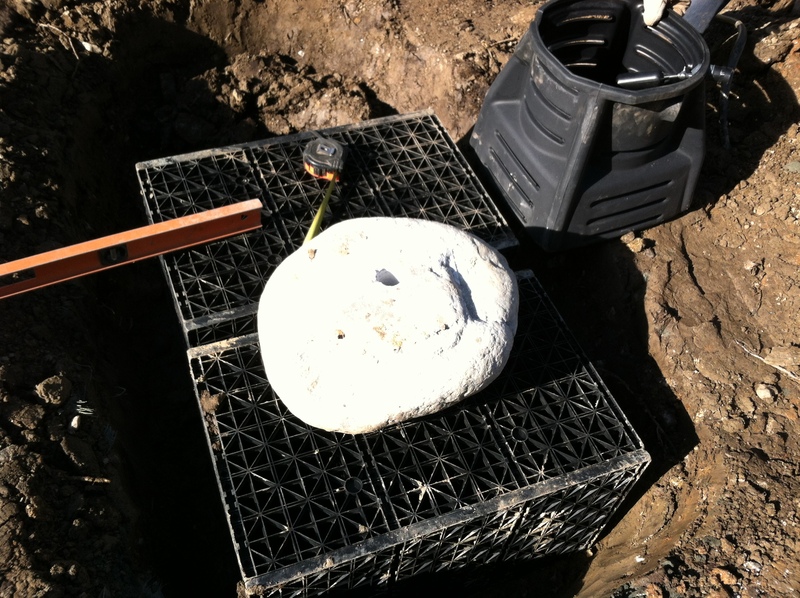 A smooth topper stone was added to cover the top of the pump vault for easy access. The basin is filled in with River Jack and you can see the cover for the pump vault off to the side. Since the stone for the labyrinth was so precisely cut and formal, I wanted the entrance of the Heart Space to be a little more informal and so used irregular stone. This informality sets you up for the journey through the labyrinth. My stone mason used irregular bluestone to pave right next to the water feature to create the Heart Space. 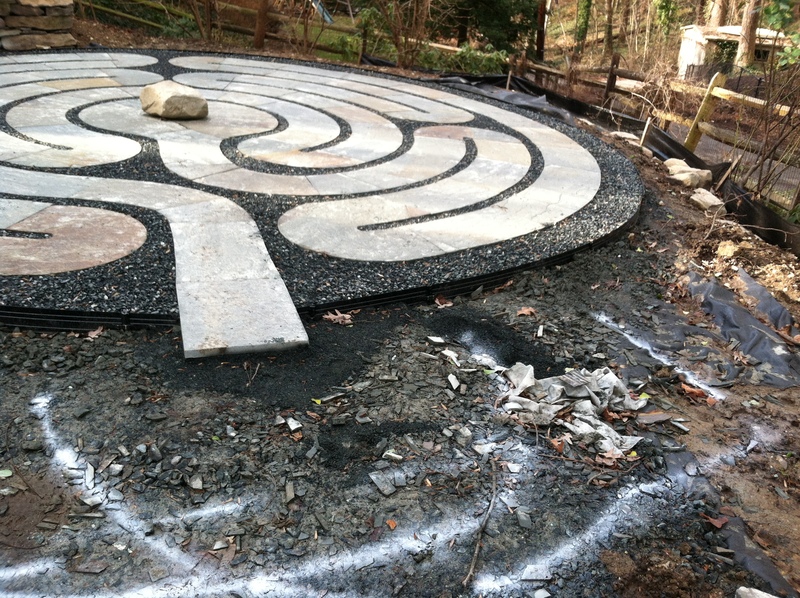 In the spring when we landscape around the labyrinth, I will finish setting the boulders around to hide the liner. 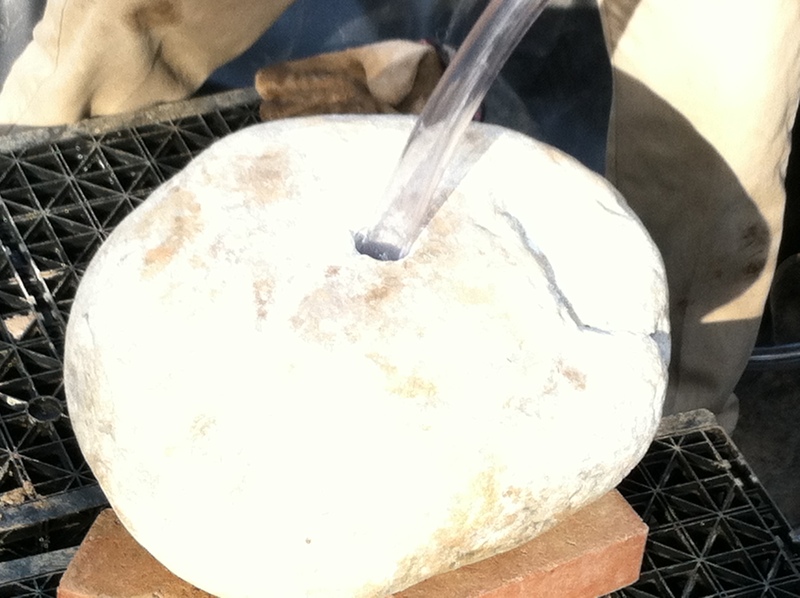 The bluestone goes right up to the Heart Space water feature. 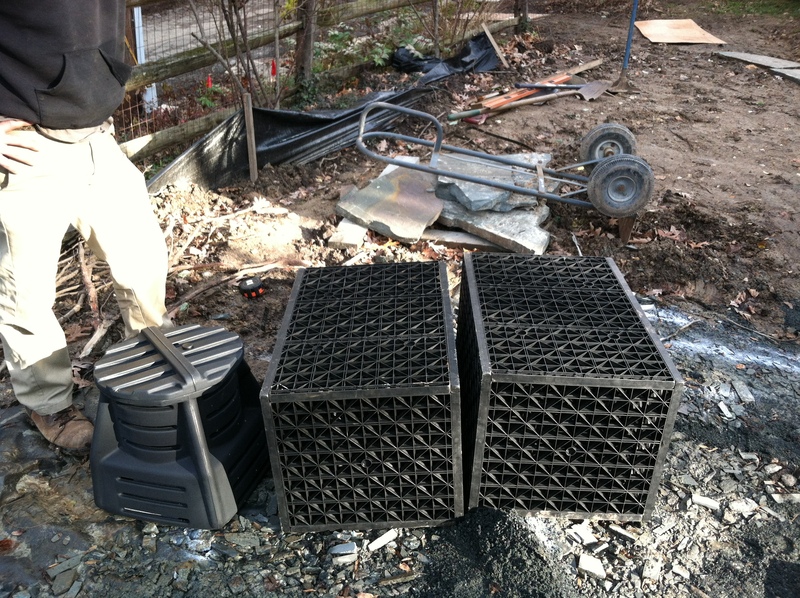 Part of the liner is exposed until we finish landscaping around the entire labyrinth in the spring. 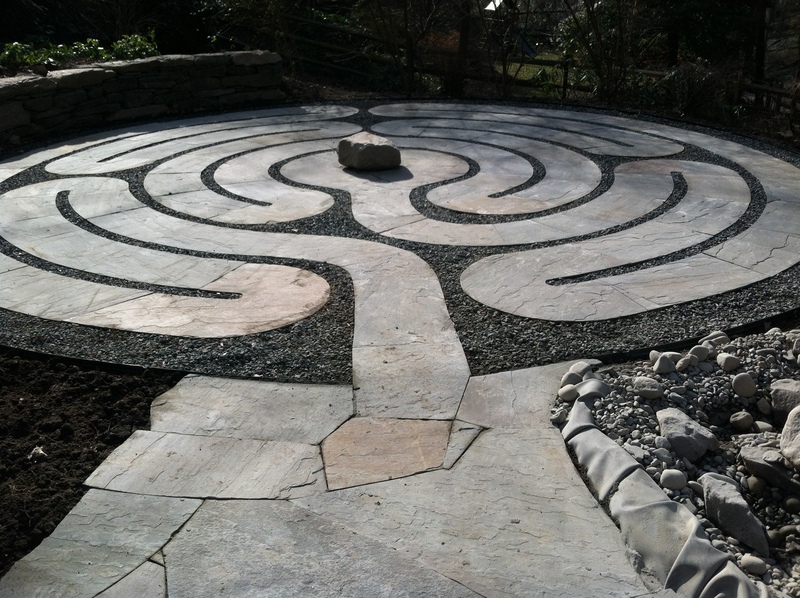 Come spring, grading and planting around the labyrinth will complete the design. I will keep you posted! I would love to experience this garden feature, can’t quite see it in my own garden, though. It definitely needs the space but you can do smaller ones.